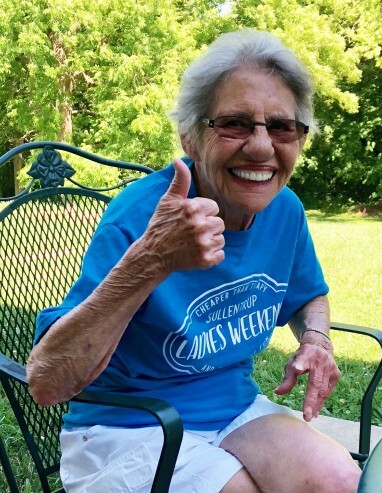 Marlene Sullentrup (nee VanBooven), 81, of Washington, passed away surrounded by her family on Sunday, April 14, 2019. Marlene was born on January 6, 1938, in Rhineland, Missouri to the late John and Hilda (nee Pottebaum) VanBooven. She loved her long career assembling world-famous corn cob pipes at the Missouri Meerschaum Pipe Factory for twenty-three years. Later, she worked at Enduro Binders for another ten years before retiring in 2003. In retirement, she was fortunate to be her grandchildren’s and great grandchildren’s biggest fans, wearing out several lawn chairs attending sporting, scouting, band, dance, and any other events that they were involved with. She loved to cheer them on and support their many endeavors. Marlene is survived by seven children, Jim Sullentrup and wife Kellie of Union, Sandy Baker and husband Marvin of Washington, Robert Sullentrup of Washington, Tom Sullentrup and wife Debbie of Washington, Jerry Sullentrup and wife Linda of Conway, Arkansas, Don Sullentrup and wife Laura of Washington, and Cheryl Spratt and husband Dale of Washington; one brother, Ronald VanBooven and wife Pat of Columbia, Missouri; one sister-in-law, Ida Mae Ray of Washington; one Godson, Troy Holt of St. Louis; one Goddaughter, Rosie McMahan of Washington; twenty-one grandchildren; forty-five great grandchildren; five great great grandchildren; other relatives; and friends. She was preceded in death by her parents; one daughter, Brenda Sumner; one sister, Joan Holt and husband Greg; and one grandson, Nicholas Spratt.